As one of the most popular style trends for Fall 2014, the military fashion trend is taking charge right now. 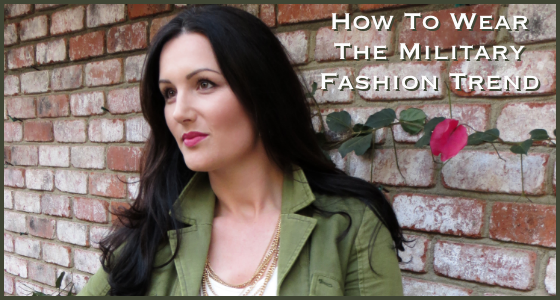 Featured here are practical style tips on how to wear this fashion trend. Salute to style this season in one of the most versatile looks all year. From camouflage prints to military coats, the military fashion trend takes its cue from soldiers’ apparel. Decorative epaulets (which, customarily are ornamental shoulder pieces worn on military officers’ uniforms) adorned military style jackets, cargo pants (that are cut to flatter a woman’s figure), and rugged earth tones are all aspects of the military fashion trend that can be easily incorporated into your wardrobe. 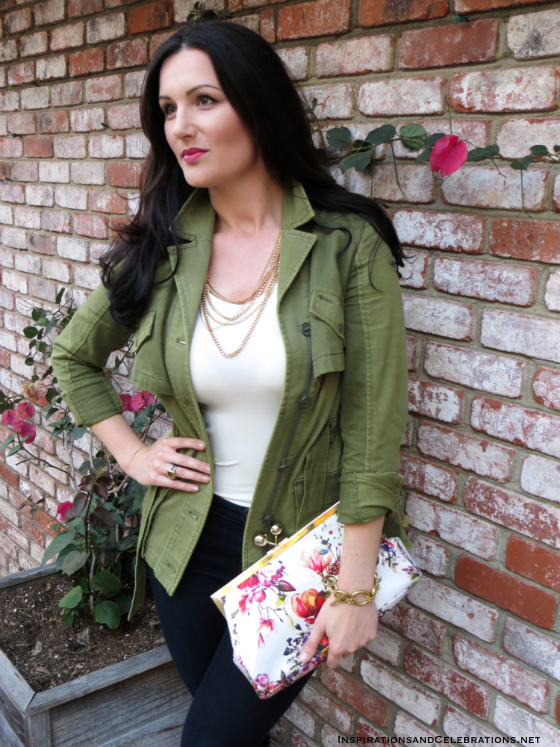 Shown here is a military style jacket, paired with contemporary apparel, jewelry, and accessories. Since most military style jackets tend be cut big and boxy, the typical silhouettes of these jackets are not especially flattering on women’s figures. 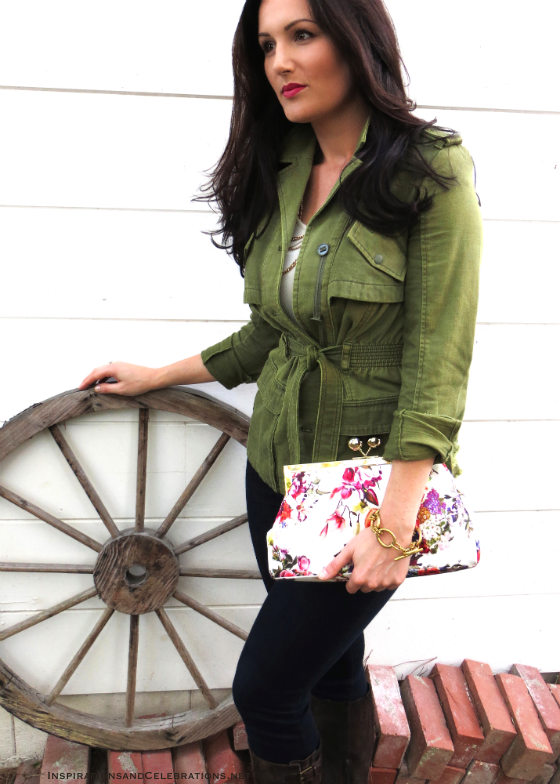 When shopping for a military jacket, it’s best to find one with a self-belting feature (like this jacket from Anthropologie), as that instantly plays up your feminine curves and makes your waistline look smaller. 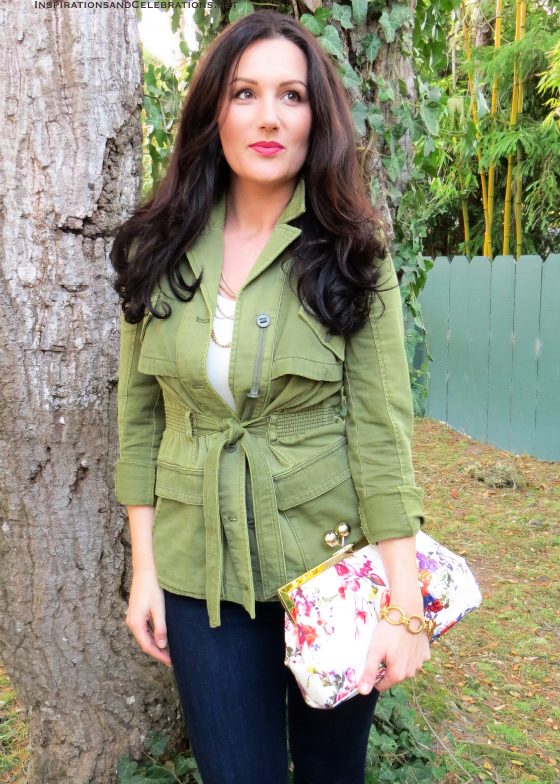 Since military jackets aren’t usually fitted, it’s advisable to wear figure-hugging apparel (like skinny jeans and a fitted top) underneath, to show off your shape in a flattering way. Since military jackets are frequently made from lightweight materials (such as cotton), they are best worn during the early Fall days (when it’s not especially cold outside). To increase the wearability of your military jacket as the days get cooler, switch from wearing tank tops to long-sleeved shirts (in warm fabrics, like cashmere or wool), and add a scarf for added insulation and color. To add a little drama to your outfit, simply pop the collar and roll up the sleeves. Since military fashion tends to be in dark, muted shades (like olive green, khaki, and brown), it’s advisable to add lighter and brighter colors into your outfit. 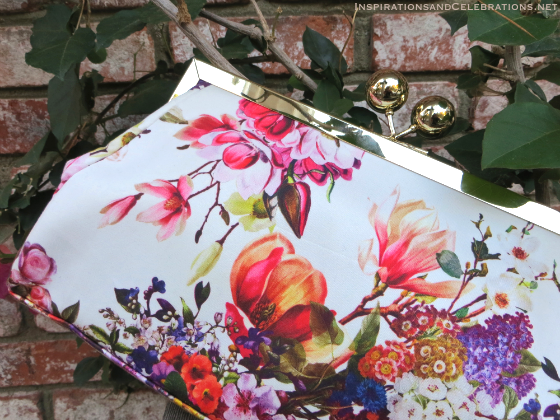 That’s where a vibrant, patterned handbag (like this charming floral print bag from Oasis) and an ivory-colored tank top (similar to this one from Anthropologie) both off-set the drab tonality of the jacket. In addition, combining feminine patterns (like floral prints) with masculine military fashion creates a striking juxtaposition. Bold gold jewelry (like this chain link bracelet from Julie Vos and ring from David Yurman) add a glamorous touch to an otherwise rugged, down-to-earth outfit. Dark skinny jeans and suede, knee-high riding boots pull the whole look together, while keeping the overall style casual and easy-going.